Previously: A question for Cllr Shaukat Ali? This entry was posted in Corruption, Councillor Greed, Elections 2014 and tagged Community Cohesion, Jahangir Akhtar, Labour Chicanery, Labour Party, RMBC, Rotherham Metropolitan Borough Council, Rotherham Politics, Rotten Rotherham, Scum Labour, Shaukat Ali by Rik. Bookmark the permalink. 11 properties ? …..and more, funny councillor ali can never be contacted . They can find him in Brecks Beefeater. Eleven, did they say eleven? 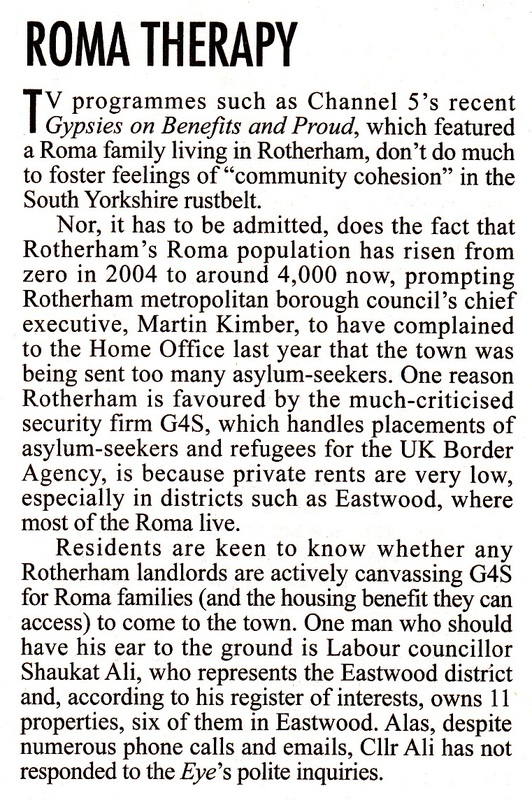 Cough, splutter, LOL, they have must got their sums wrong, so typical of Private Eye. Who else will receive the call from Private Eye about their buy-to -rent portfolio ? Thanks to the new blog this will become a big election issue, so very pleased the new blog is being supported and being given plenty of Twitter time by senior members of RMBC. Ali, I fine example of the racist Labour filth in this Borough! 11 properties in Eastwood cost a tuppence. Bottled water is more expensive. Go on bag a few for yourselves. even less now the bad landlord boys have set to work. PE states G4 Security handles placements of refugees and asylum seekers, but the Roma are neither! They are merely fellow citizens of our wonderful EU who have taken advantage of their right to relocate in mass to another country in order to better themselves, admittedly doing so courtesy of our free welfare system. and in doing so they clearly don’t give a dam how this affects the indigenous of this country!